The second season of Showtime’s television drama, Billions, features go in its fifth episode, reports Joe Maia (previously reported here). The series, loosely based on a true story, portrays a high-stake legal battle between U.S. Attorney Chuck Rhoades and hedge-fund manager, Bobby Axelrod. 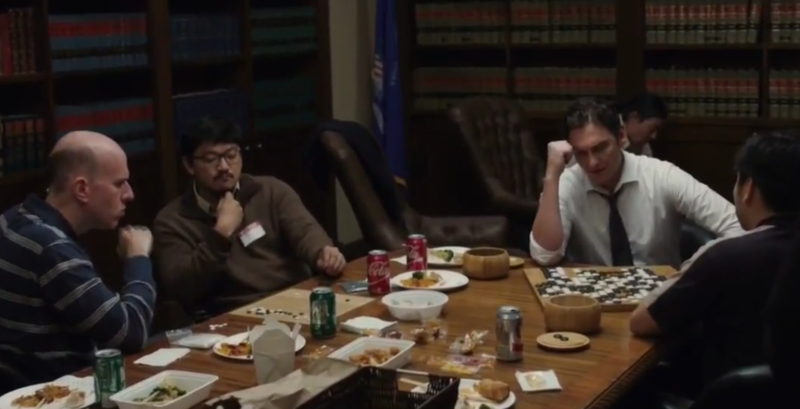 In the episode, Rhoades (played by Paul Giamatti) enters a conference room to find one of his lawyers, Brian, and finds him playing one of several active go club games. After Rhoades points out that he had tried calling, Brian replies that they put all of their phones in a basket before they play because “go players didn’t have cellphones in ancient times.” Rhoades gets back to business, telling Brian that he needs to coordinate with the FBI to set up surveillance. He’s about to leave when he remembers, “Oh, I almost forgot… You’d better block that monkey jump at the bottom.” The series currently airs Sundays on Showtime.